113.—The Thames at Coway Stakes. In noticing the two descents of Cæsar upon Britain (page 26) we said, “From the nature of his inroad into the country, no monuments exist, or could have existed, to attest his progress.” But there is a monument, if so it may be called, still existing, which furnishes evidence of the systematic resistance which was made to his progress. Bede, writing at the beginning of the eighth century, after describing with his wonted brevity the battle in which Cæsar in his second invasion put the Britons to flight, says, “Thence he proceeded to the river Thames, which is said to be fordable only in one place. An immense multitude of the enemy had posted themselves on the farthest side of the river, under the conduct of Cassibelan, and fenced the bank of the river and almost all the ford under water with sharp stakes, the remains of which stakes are to be there seen to this day, and they appear to the beholders to be about the thickness of a man’s thigh, and being cased with lead, remain immoveable, fixed in the bottom of the river.” Camden, writing nine centuries after Bede, whose account he quotes, fixes this remarkable ford of the Thames near Oatlands: “For this was the only place in the Thames formerly fordable, and that too not without great difficulty, which the Britons themselves in a manner pointed out to him [Cæsar]; for on the other side of the river a strong body of the British had planted themselves, and the bank itself was fenced with sharp stakes driven into the ground, and some of the same sort were fastened under water.” Camden here adopts Cæsar’s own words: “Ripa autem erat acutis sudibus præfixis munita, ejusdemque generis sub aqua defixæ sudes flumine tegebantur“ (’De Bell. Gall.’ lib. v.). 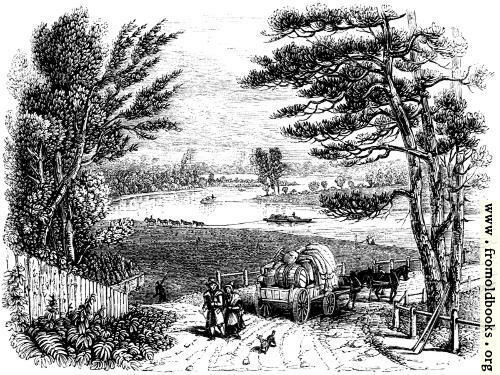 Our fine old topographer is singularly energetic in fixing the place of Cæsar’s passage: “It is impossible I should be mistaken in the place, because here the river is scarce six foot deep; and the place at this day, from those stakes, is called Coway Stakes; to which we may add that Cæsar makes the bounds of Cassivelan, where he fixes this his passage, to be about eighty miles distant from that sea which washes the east part of Kent, where he landed: now this ford we speak of is at the same distance from the sea; and I am the first, that I know of, who has mentioned, and settled it in its proper place.” It is a rational belief of the English antiquaries that there was a great British road from Richborough to Canterbury, and thence to London. Cæsar’s formidable enemy, Cassivelaunus, had retreated in strong force to the north bank of the Thames; and Cæsar speaks of the river as dividing the territories of that chieftain from the maritime states. If we look upon the map of England, we shall see how direct a march it was from Canterbury to Oatlands near Walton, without following the course of the river above London. Crossing at this place, Cæsar would march direct, turning to the north, upon the capital of Cassivelaunus,—Verulam, or Cassiobury. 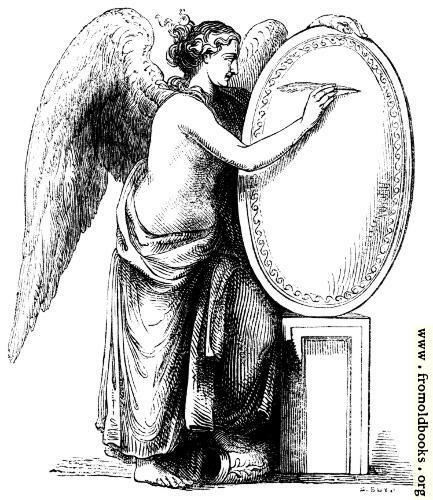 Our engraving (Fig. 113) represents the peaceful river gliding amidst low wooded banks, disturbed only by the slow barge as it is dragged along its stream. At the bend of the river are to this hour these celebrated stakes. They were minutely described in 1735, in a paper read to the Society of Antiquaries, by Mr. Samuel Gale: “As to the wood of these stakes, it proves its own antiquity, being by its long duration under the water so consolidated as to resemble ebony, and will admit of a polish, and is not in the least rotted. It is evident from the exterior grain of the wood, that the stakes were the entire bodies of young oak-trees, there not being the least appearance of any mark of any tool to be seen upon the whole circumference, and if we allow in our calculation for the gradual increase of growth towards its end, where fixed in the bed of the river, the stakes, I think, will exactly answer the thickness of a man’s thigh, as described by Bede; but whether they were covered with lead at the ends fixed in the bottom of the river, is a particular I could not learn; but the last part of Bede’s description is certainly just, that they are immoveable, and remain so to this day.” Mr. Gale adds, that since stating that the stakes were immoveable, one had been weighed up, entire, between two loaded barges, at the time of a great flood. See the McDevitte and Bohn translation for example. 114.—Conflict between Romans and Barbarians. 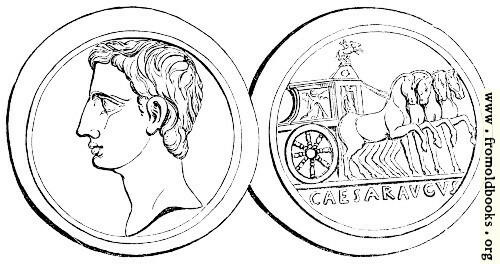 119.—Coin of Claudius, representing his British triumph. From the British Museum. Despair and Death; Shame beyond these attend ’em! 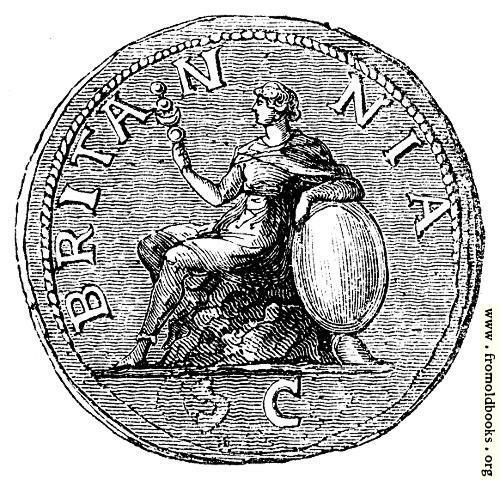 122.—The earliest figure of Britannia on a Roman coin. 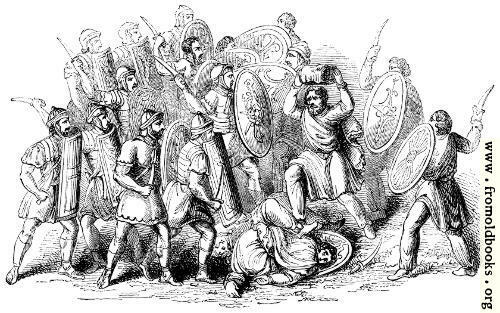 The Roman dominion in Britain nearly perished in this revolt. Partial tranquillity was secured, in subsequent years of mildness and forbearance towards the conquered tribes. Vespasian extended the conquests; Agricola completed them in South Britain. His possessions in Caledonia were, however, speedily lost. 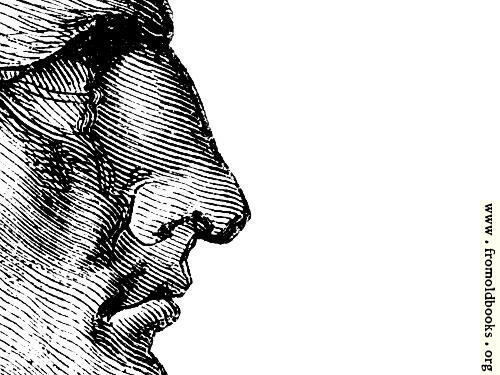 But the hardy people of the North were driven back in the reign of Antoninus Pius. Then first appeared on the Roman money the graceful figure of Britannia calmly resting on her shield (Fig. 122), which seventeen centuries afterwards has been made familiar to ourselves in the coined money of our own generation. Let us pause awhile to view one of the great Roman cities which is held to belong to a very early period of their dominion in England.